The project produces noise-canceling headphones which allow the background noise to be minimized while listening to music. To keep the microphone signals in phase, the project consists of a phase switch that amplifies the background sound making it lend itself to several other interesting functions. There are three op-amp circuits that make up the electronics where each is built around one half of a dual op-amp NE5532. The op-amp is used by each circuit in a different configuration. A non-inverting pre-amp is done by the first circuit, a unity-gain phase-inverter by the second, and an inverting headphone amplifier by the third. 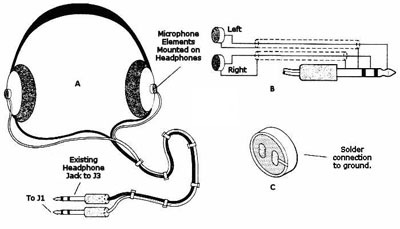 The circuit is actually two circuits side-by-side since the noise-canceling headphone is a stereo device. All inverted sounds played back through the headphones cancel out the original sounds, leaving nothing but silence since the noise-canceling headphone is a simple phase-inverting amplifier. For different situations, the amount of canceling can be adjusted. The circuit is relatively simple and can be easily assembled on a perfboard with two parts containing the construction of electronics and modifying a pair of headphones. The microphones are mounted on earpieces of the headphones with a dab of silicon sealant.